Sooooo…. I had an unfortunate incident with a parking spot stopper thing. You know, those concrete things that stop you from pulling up to far… Yea, went over one that had a piece of rebar barely sticking out of one of the 2 holes in it… It was just enough to easily pass under the bumper pulling in but then got hooked onto the bumper when pulling out nearly ripping the bumper off. As a result, 2 of my 4 parking sensors got pulled out of their holders. I started under hood, remove the rubber strip/gasket on the front of the car by just pulling on it, pretty simple. 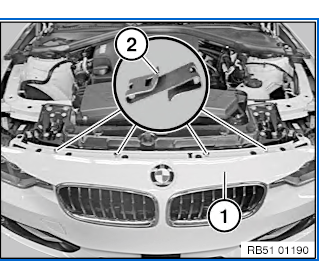 Remove the 6 T30 torx bolts highlighted below and the 2 T25 torx bolts above the headlights. 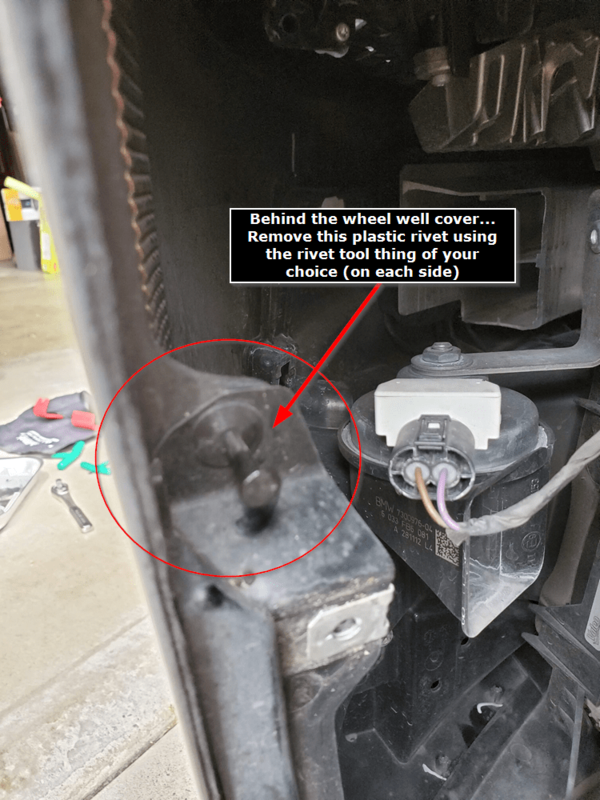 In the wheel well on each side remove the 3 (on each side) 8mm bolts highlighted below. It helps to turn the steering wheel to get easier access to the bolts. 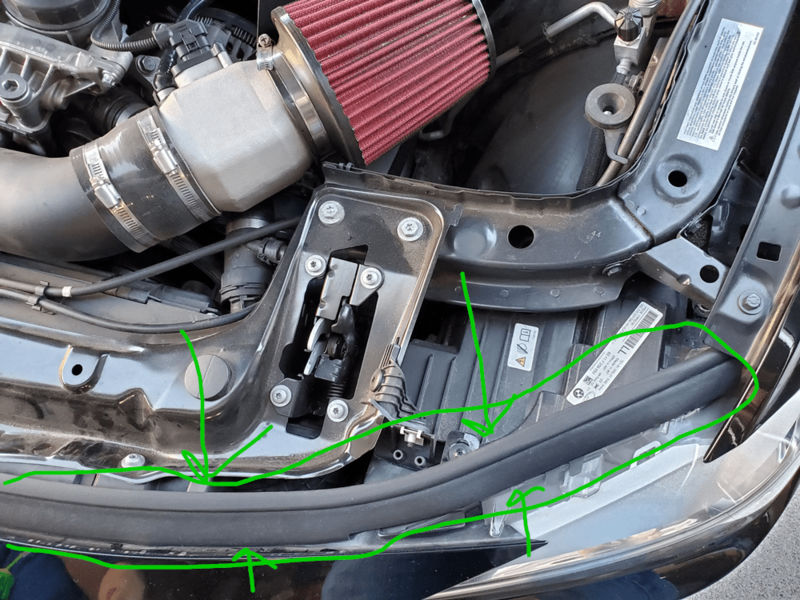 Remove the 2 highlighted (long) 8mm screws. 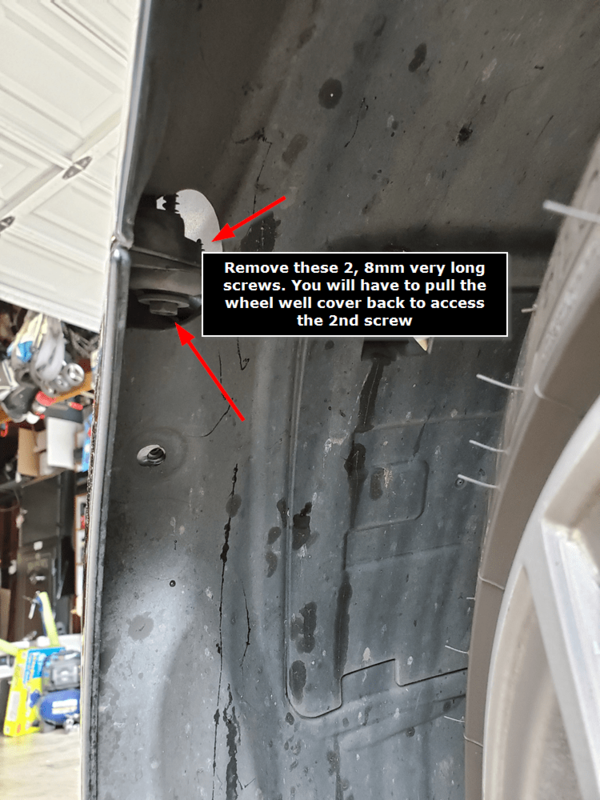 You will have to pull the wheel well cover back to access the 2nd screw. Remove the highlighted rivet in the picture below on each side. You will need to pull the wheel well cover back to access it. Underneath the car there are a total of 8 bolts/rivets connecting the bumper to the under-belly shield. Remove those as well. You can pull down on the bumper slightly to figure out which ones need to be removed. WARNING! I had the “Ultrasonic sensors PDC” and had to pull the plastic cable mount thing out to get enough slack. 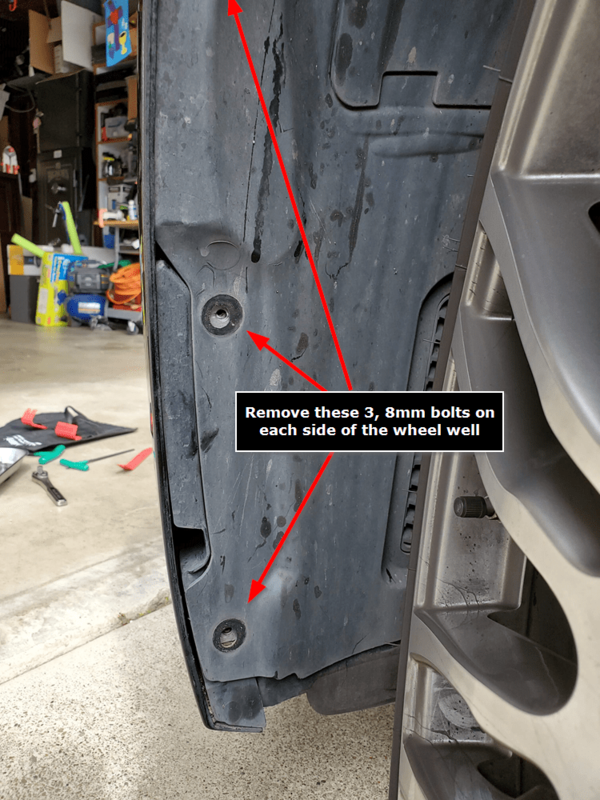 Check the below image for what to look out for before pulling the bumper off. Start up top on each side and pull back firmly paying attention to the area highlighted below where the bumper slides under these things. Now on each outer side near the headlights pull down slightly to separate the upper bumper clips/indents. Grab the holes in the lower grill area and pull back firmly, if the top sections are separated properly the whole bumper should pull off pretty easily. Reinstall was super simple for my car… I was initially worried about it lining up properly, etc… but had no issues at all. It just snapped back in. I’ll post a few pictures below here with what ISTA says about re-installation but honestly it was a breeze on my car. I didn’t even refer to ISTA when I did. Tightening torque for the 6 T30’s and 2 T25’s in step 2 above is 4.6 Nm or 3.3 ft/lbs. I just hand tightened them all. to use front bumper license plates in Tx.